Okay I guess it's time to archive the 2017 attendance sidebar. Sigh. My god, we went to a lot of games last year. 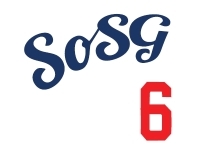 Prior SoSG attendance records: 2008 (18-15), 2009 (21-10), 2010 (9-8), 2011 (10-7), 2012 (24-18), 2013 (24-16), 2014 (22-12), 2015 (27-13), 2016 (10-5). I'm missing, but I only went to one game. Now to remember which one. Found it. Edited it in. A loss, alas. WHEN WILL OUR BINARY NIGHTMARE END?!?! He's a closer, a scoundrel. You'd like him.